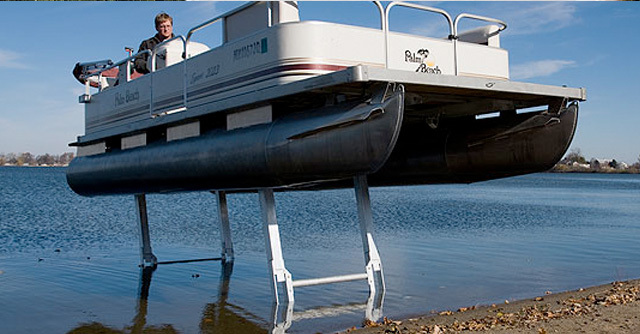 An innovative on-board pontoon lift that travels with you. Raise your boat with the touch of a button. Hewitt Pontoon Legs are an innovative pontoon lifting system installed on the underside of the pontoon deck. Four aluminum legs raise and lower your pontoon in seconds at the touch of a button. Pontoon Legs are available in electric or hydraulic versions. Park your boat anywhere, and eliminate the hassle of winter lift removal. 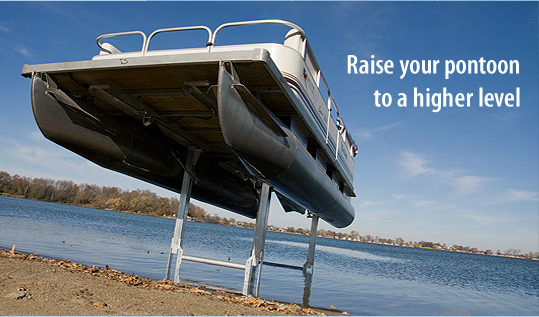 Installing Pontoon Legs will not void your boat’s warranty. For lakeside protection of your Pontoon Legs-equipped pontoon, free-standing canopies are available in a wide range of styles and colors.